You are here: Home / What is an Orangery Conservatory? Are Orangeries different to conservatories? Is there a difference between an orangery and a conservatory, if so, what is it? There are many differences between an orangery and a conservatory, but the two biggest would be how much they cost and what they look like. The visual differences are quite marked in that conservatories have glass angles sloping roofing and orangeries have a flat roof with a raised glass lantern section. 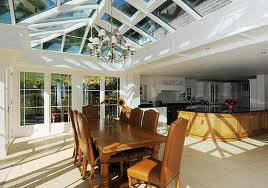 Conservatories usually have at least 70% of the room made from glass – that is to say that the sides and the roof is mainly made of glass or in some cases for cheap conservatories, poly-carbonate roofing. Orangeries will have a lot of solid walling.